Now into its fifth decade of UK manufacturing, Bluemay has built an impressive range of products and associated services, all subject to systems certified to AS9100, the aerospace industry quality standard. 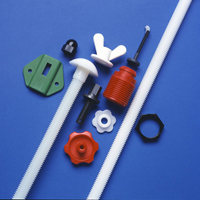 Our range of non-metallic engineering components includes parts such as custom injection mouldings, plastic nuts, screws, Buffalo bolts, nylon washers, flanged bushes, spacers, protecting caps, bearings, machined parts, water jet cut parts, liners, shims, seals, gaskets, caps, plugs and of course our world famous nylon threaded rod. To view the standard range please navigate the website using the dropdown navigation bar, but please note that with the range of tooling available to us it is not possible to show every single size available even for our standard products. Tooling for non-standard items can be made quickly and economically, sometimes by adapting existing tooling at low cost. Call our Sales team on 01380 821811 to discuss your requirements or use the Contact Page to email us.